With a population of 400,000 and the busiest port in the Bay Area, Oakland is a thriving city. Despite having many options for public transportation, most area commuters still choose their car. This makes it even more important to find all the options for cheap car insurance that Oakland has available. 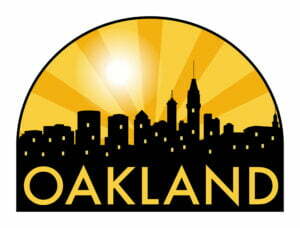 Most sources state that the average auto insurance premium in Oakland is around $1,100 per year. That price can vary wildly however, depending on your age, driving experience, and the vehicle you drive. Because it is an urban area, and part of the larger Bay Area, the rate of uninsured drivers is slightly higher than the state average. There is also an increased risk of traffic collision and vehicle theft. Auto theft rates affect your insurance rates the most, as they directly impact insurance companies’ loss ratios. If you live in Oakland you might want to consider purchasing Comprehensive coverage, but expect to pay a higher premium for it than you would in other cities. The best way to save money on your car insurance is to shop around as frequently as possible. Rates in Oakland are constantly adjusting based on new data, so the price you pay today may not be the lowest tomorrow. So if you’re a resident, or are thinking of moving to Oakland, you know that the number of opportunities will continue to grow. And the more you learn about your city, the better choices you can make when it comes to your car insurance.